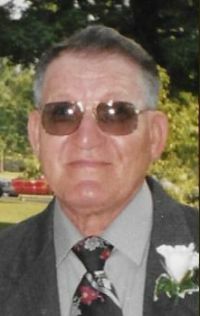 Wayne L. Abernathy, 87, of Galva, went to be with the Lord Jesus and his wife on Thursday, October 4, 2018, at the Toulon Rehabilitation & Health Care Center. Funeral services will be at 11:00 a.m. Saturday, October 13th, at the Galva Chapel of Stackhouse-Moore Funeral & Cremation Services. Rev. Ivan Brake will officiate. Burial will be in the Galva Cemetery. Visitation will be one hour prior to the service at the funeral home. Memorials may be made to the Galva Assembly of God Church. Wayne LeRoy Abernathy was born March 28, 1931 in Prairie City, IL, the son of Theodore and Ona Miller Abernathy. He was educated in Bushnell, IL schools. His marriage to Doris M. Jennings took place on April 15, 1950 in Quincy, IL. She passed away on October 30, 2016. He worked at the Galva Foundry for 40 years and at Galva Iron & Metal for 28 years. Wayne was a 58 year member of the Galva Assembly of God Church. He loved adult coloring, word search, and watching television. Those surviving are his two daughters, Katrina "Tina" Abernathy and Tonya L. Abernathy, both of Galva, a daughter-in-law, Sharon Abernathy, LaFayette, two grandson, Bradley (Marlo) Abernathy, Galesburg, Kipp (Michelle Offill) Abernathy, Rock Falls, IL, four great grandchildren, Zach, Bryce, Krayten, and Kieryn Abernathy, four sisters-in-law, Ginger Abernathy, Macomb, IL, Pauline Abernathy, Rushville, IL, Cathy Abernathy, Galesburg, and Jenny Jennings, Galva, three nieces, Tammi (Troy) Roberts, White Water, MO, Sharon (Frank) Bainbridge, Galva, and Pam (Nick) Nicolay, Kewanee, and a nephew, Jeff (Debbie)Cale, Colchester, IL. Also surviving are special friends, Ron Hepner, Ruth Hepner, Brandon Macklin, Mike and Karen Rohrig, Drew and Krystal Dirks, all of Galva, and Lenny, Jenny, and Aribella Fryer of Galesburg. His parents, his wife, Doris, a son, Timothy, two sisters, and six brothers preceded him in death.